Why wasn't Nielsen measuring these other platforms previously? The company has but says it hasn't been able to include those measurements in its ratings because of the C3 and C7 eligibility rules that were established by buyers and sellers in 2006. "Those rules stop us and don't allow us to put any of that viewing into the ratings," said Megan Clarken, evp, global watch product leadership for Nielsen. "You can't add anything to the ratings if it's viewed out of the seven-day window—it's not allowed to be included." Because total audience measurement isn't restricted to C3 and C7, those platforms can now be included. Is anything missing from total audience measurement? While it will cover almost all of the ways people view content—VOD, DVR, mobile, PC, tablet, connected TV devices like Xbox, Apple TV and Roku, as well as linear TV—it won't measure content streamed on wearable devices like the Apple Watch. "It's not something we measure," said Clarken. "There's always going to be things that are so small for us right now." Will Netflix programming be measured? Some, though not all of it. While Netflix and Amazon, which refuse to share any ratings metrics, strip Nielsen's digital watermarks from its content, some of the studios that supply content to those SVOD (subscription video on demand) providers want to know how many people are watching those shows. "Our clients have an interest in being sure they're measured appropriately by a third-party independent," said Clarken. Those clients have supplied Nielsen with audio files for their content, which can be measured by Nielsen's meters in its panelists' homes. "What we can't do is identify the source—we don't know that it's Netflix," said Clarken, though that data can often be gleaned by process of elimination. Currently, Nielsen will only be measuring the programming requested by specific clients—who have given Nielsen audio files for 4,000 separate episodes—but not all Netflix or Amazon programming. "Ultimately, we'd like to get to the point where we do have a syndicated service and Netflix is being measured, but there's a lot of hurdles there," said Clarken. Will YouTube content be measured? Yes. "We will cover everything that's on YouTube," said David Wong, svp, product leadership at Nielsen. "They're the opposite of Netflix. They're willing to share information about their viewership and then give us comprehensive information by platform, by asset, by channel." Nielsen is working with all digital publishers to include their content in total audience measurement, and has been collaborating with Google on VideoCensus, a panel based-digital measurement tool, for several years. 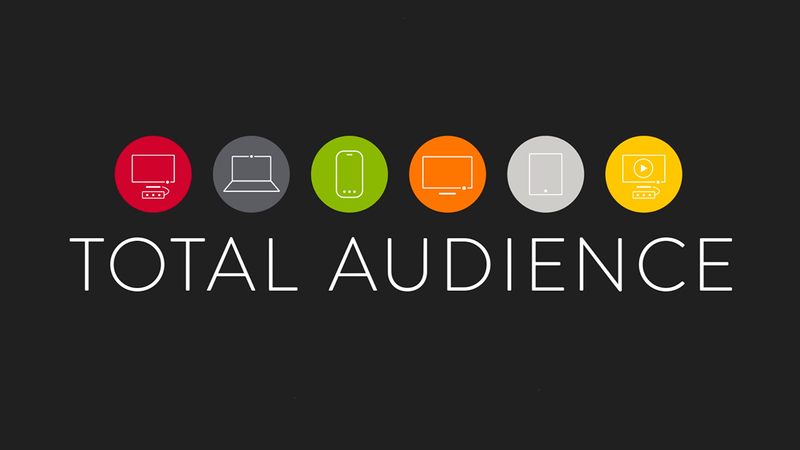 When is total audience measurement coming? Nielsen will debut total audience measurement in December in what it is calling "a private industry preview," said Kelly Abcarian, svp, product leadership. At that point, clients will only be able to view their own data but won't have full use of the tool and can't see how their content stacks up against others. The company is planning to make its "syndicated" view, wherein all clients will have access to the total audience measurement tool and be able to see each other's performance, available late in the first quarter of 2016. What are the common metrics? Content will be measured by "average minute audience" (the average of the audience per minute) and GRP (gross ratings point, where one GRP is equal to 1 percent of TV households). "Nothing changes there," said Clarken. "And then the flexibility of being able to look at your content, or how you've performed from an ad perspective as a network allows you to use the data to tell the story the best way you can. But in comparing, we still rally around the GRP as the foundation." Will Nielsen's national panel remain the same size?